This painting by Norman Rockwell, Willie Gillis Cat's Cradle, appeared on the cover of The Saturday Evening Post published June 26, 1943. This is yet another timeless favorite of Rockwell collectors, a classic for the ages. Another title for this painting is Willie's Rope Trick. This name is a play on theold magic trick, Indian Rope Trick. This painting was Rockwell's third cover for The Post in 1943. In 1943, there were five Norman Rockwell Saturday Evening Post covers published. This painting was also Rockwell's 215th overall of 322 total pictures featured on the cover of The Post. Rockwell's career with the Post spanned 47 years, from his first cover illustration, Boy With Baby Carriage in 1916 to his last, Portrait of John F. Kennedy, in 1963.
on page 153 of Norman Rockwell, A Definitive Catalogue by Laurie Norton Moffatt. This classic Norman Rockwell painting shows Willie Gillis, America's boy next door, with a new friend. 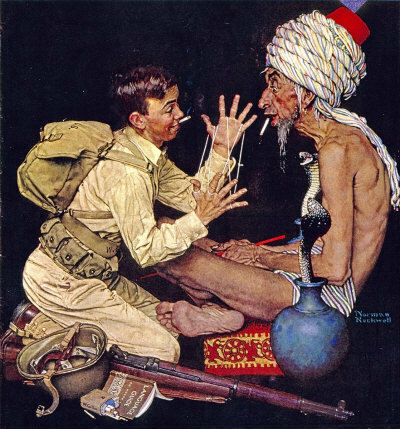 This is the eighth in the Norman Rockwell Willie Gillis series of covers for The Saturday Evening Post. Rockwell painted eleven images that appeared on the Post cover and one illustration that was featured inside the Post. In this painting, we see Willie showing his rope trick to a snake charmer. Remarkably,the snake charmer seems absolutely flabbergasted by Willie's simple use of the string. The older man even drops the cigarette right out of his mouth. His entire facial expression shows disbelief and amazement. The setting for this painting is apparently India, although I do not recall American servicemen being stationed in India during World War Two. Maybe the setting is another country with a large Indian population. Rockwell certainly treats us to a lot of details in this illustration. The cobras on either side of the snake charmer seem ready to strike. The olde rman's turban also features a lot of subtle color hues. Willie Gillis Cat's Cradle was only one of 322 Norman Rockwell Saturday Evening Post covers; Here is the list of Norman Rockwell Saturday Evening Post cover illustrations. Another very interesting feature of this painting is Willie's uniform. From the bottom with his boots and leggings all the way to the top with his helmet, the uniform is authentic. Rockwell always painted authentic detail in his paintings. At the bottom of the picture, we can also get to see Willie's field rifle. Next to the rifle, we can also see Willie's cigarette holder and his Language Guide book. I cannot read the country that the language guide refers to.